We want you to be able to continue playing along with the music from class in your home. 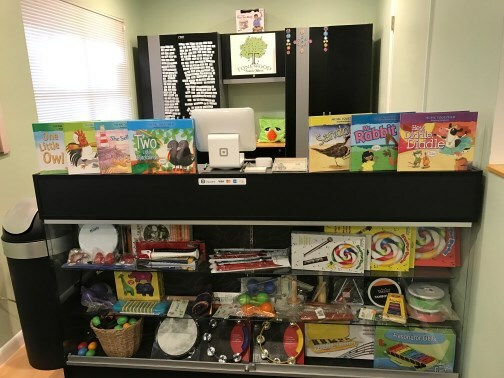 We have all of the instruments from the "play-along" box for sale in our store as well as a collection of Music Together®'s Singalong Storybooks to enhance your at-home play. Also for sale are CDs of Music Together's Family Favorites 1, 2, and the Lullabies collection. If you really love him, you can also purchase Tonewood's own scarf-bag monster in miniature -- Tiny Toney comes with seven of the same rainbow-colored dancing scarves from class. Visit our store before or after your class.